If you’re packing up your home contents to move or to put your possessions into self-storage, check out these top tips for packing and make a checklist. It means you won’t be worried about forgetting things. By ticking off the tasks you’ve completed you can see how you’re getting on with the job. Leave yourself plenty of time to get things done. It will seem a lot less overwhelming if you can do one or two things each day. First of all, decide how you’re going to pack. Do you want to go through your home room by room? If this is the case pick the least used rooms first and work your way towards the living room or the kitchen. Another way is to go through your home and categorise your possessions by item. This way you can, for example, pack all your books and cd’s first, then ornaments and after that, bedding, curtains and towels. Leaving your clothes until last. Don’t pack items you don’t want or use. Make a pile and arrange to sell or give away things you know don’t need to be packed. Leave yourself enough time to advertise goods that might need collecting or items that you want to list on e-bay or a similar site. If you’re giving away or selling large items you are still using like a sofa, arrange for them to be delivered or picked up the day before you move out. Before you remove cables from an electronic device, take a photo of the cables as they are plugged in. That way when you come to reconnect it you can see at a glance how the cables fit into the appliance. If you’re going away for a while then put the photos on a pen drive to keep in a safe place for when you return. You can then disconnect the cables and stick them on to the device with strong tape. Any screws from furniture should go into zip-lock bags which should then be attached to the furniture. Make sure though they are labelled to tell you where they came from, just in case they become separated. If you have spare suitcases on wheels, use these to pack heavier items. It is much easier to wheel a suitcase full of books than to carry a heavy box full of them. 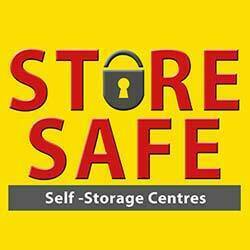 Finally, if you’re moving into Self-Storage give Store-Safe a call to arrange for them to collect your home contents. You can contact them by phone on 01782 785 370 or fill in the contact form on our website.